Important note: Unfortunately still enforced no real standard for HTML5 advertising media such as these ads to print. Therefore, the following descriptions reflect the back as AdSpirit can best deal with such advertising. Note also that the recommendations may change at any time if the market adjusts in a certain way. With some software tools such as Adobe Edge advertising materials can be created that consist of multiple files. In general, these are referred to as "HTML5 advertising media" even if that's not entirely true, since in principle any delivered by us HTML advertising media is an HTML5 advertising. The ad must be delivered as a ZIP compressed file. All files must be located in a shared directory path within a zip file per advertisement. For example werbung.zip extracted to advertising/Skyscraper/*. The files may not be directly included in the zip but in a subfolder are (all files together or in various sub-dispensing). Pro advertising materials there must be exactly one HTML file named index.html. All files must be relatively involved (eg src = "js/scripts.js"). The only exceptions are external resources such as frameworks and so on; they must be completely integrated with a complete domain (eg src="http://mycdn.myadserver.com/frameworkxyz/script.js"). The HTML file is found as IFrame. 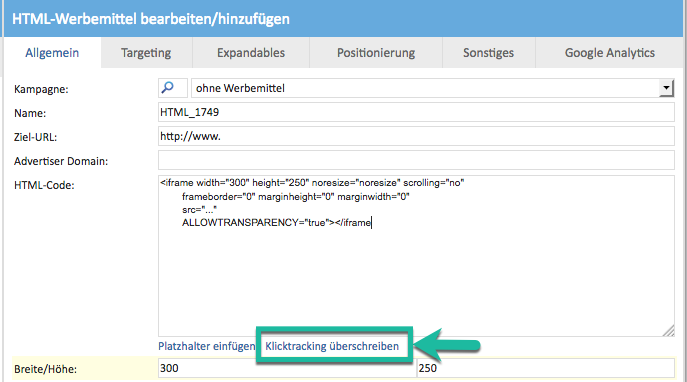 therefore, the HTML file must order tracking click the parameter &clickTag=... query. 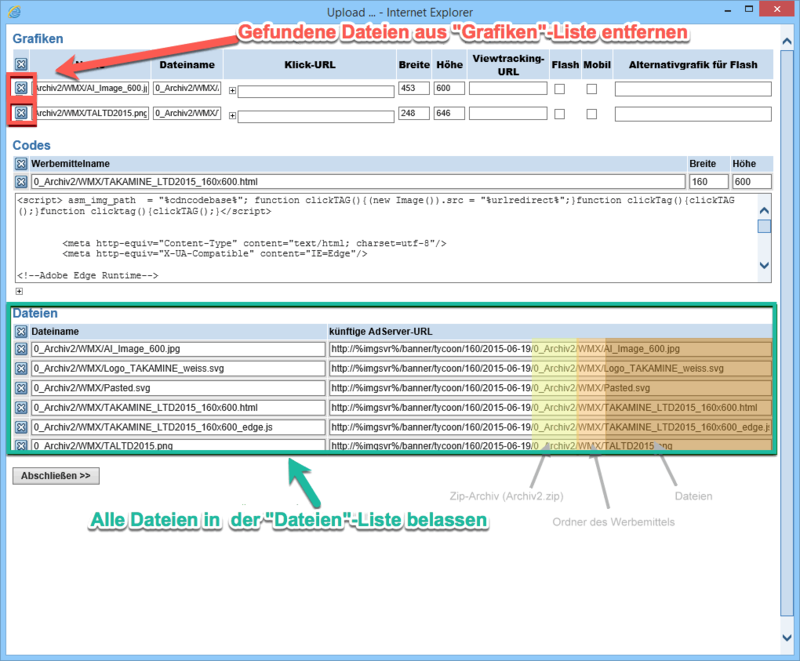 <a href = "http://www.zielseite.de" onclick = "window.open (getParameter ( 'clickTag') + encodeURIComponent (this.href), '_blank'); return false"> click here </a>! The IFrame is assigned an ID, which is awarded by AdSpirit (<iframe id = "% creativeId%" ...>). By means of this ID can address AdSpirit the IFrame and adjust its size. The ad informed by mail message AdSpirit about the fact that it wants to open or close. To this end, the ad parent.postMessage(dhtml.getVar("expand"),"*") and should parent.postMessage(dhtml.getVar("collapse"),"*") used to from the IFrame URL parameters passed to the right list to learn identifier for the EXPAND or Collapse function. If this is not possible, can alernativ parent.postMessage("expand","*") and parent.postMessage("collapse","*") are used. The ad needs to know automatically that its size is changed and it has to adjust accordingly in style. To Sidebar Ads must implement via IFrame code as expandables an ID will be awarded and the content must adapt to the design (see points 1 and 3 above). To sending postMessage can be dispensed with. To load an HTML5 advertising medium high, pack out the advertisements in a directory and package this directory into a ZIP file. Download this zip file high on the AdServer. The AdServer unpack the Zip and will automatically detect graphics and HTML files. Unless graphics were detected, remove them from the "Graphics" list in the upload window (but leave all the files in the "Files" list of the upload window). In the "code" list the HTML file should appear. The AdServer has already made changes here. Provided that two code variants were detected for the HTML file, use the IFrame variant. In some cases, the click tracking of the advertising material, unfortunately, can not adapt. In these cases, the click tracking are trying to manually override. This is done by a transparent GIF is placed over the ad and this will be made clickable. If the user clicks on the ad, it no longer triggers so from the actual click event of the advertisement but the click event of the GIF. When an HTML advertising media has been created, the function "Overwrite click tracking" will be executed and the ad server uses the required code. Then the ad must be saved. The click goal must now be registered in the destination URL. <iframe width = "300" height = "250" noresize = "noresize" scrolling = "no"
frameborder = "0" margin = "0" margin width = "0"
In the example shown in green is the part of the customer advertising medium while the red marked part is the newly added code is used to override the ad-click tracking. Flash files were convertiert with Google Swiffy HTML5 are typically only a single HTML file. This can as it is uploaded to AdSpirit. AdSpirit recognize the file and sets automatically the parameters for the Flash clickTag (note correct spelling!). Document.getElementById ( 'bg-exit') addEventListener ( 'click', bgExitHandler, false). For example, create a folder "MeineKampagneXYZ" and create in each advertising material another example folder "Werbemittel_1", "Werbemittel_2" etc. Export the advertising material from Adobe Edge out incl. All necessary files in the advertising media folder. Pack the campaign folder including all subfolders in a zip file.